Researchers at the National Institute of Standards and Technology (NIST) have demonstrated that ordinary blue light can be used to significantly improve the ability to see objects engulfed by large, non-smoky natural gas fires—like those used in laboratory fire studies and fire-resistance standards testing. 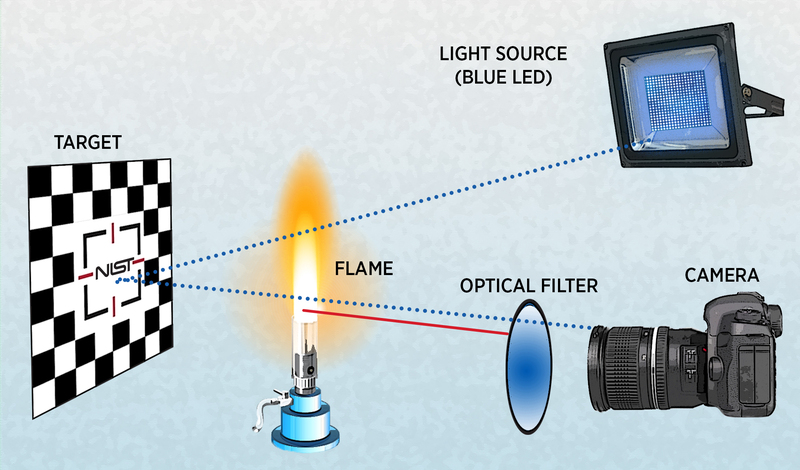 Graphic illustrating the NIST narrow-spectrum illumination method for imaging through fire. Blue LED light is directed through a gas fire, reflects off the target object behind the flames and is captured by a camera after passing through an optical filter. This reduces the observed intensity of the flame by 10,000-fold and yields highly detailed images. However, just seeing the target wasn’t enough to make the blue-light method work for DIC analysis, Hoehler said. The researchers also had to reduce the image distortion caused by the refraction of light by the flame—a problem akin to the “broken pencil” illusion seen when a pencil is placed in a glass of water. “Luckily, the behaviors we want DIC to reveal, such as strain and deformation in a heated steel beam, are slow processes relative to the flame-induced distortion, so we just need to acquire a lot of images, collect large amounts of data and mathematically average the measurements to improve their accuracy,” Hoehler explained. 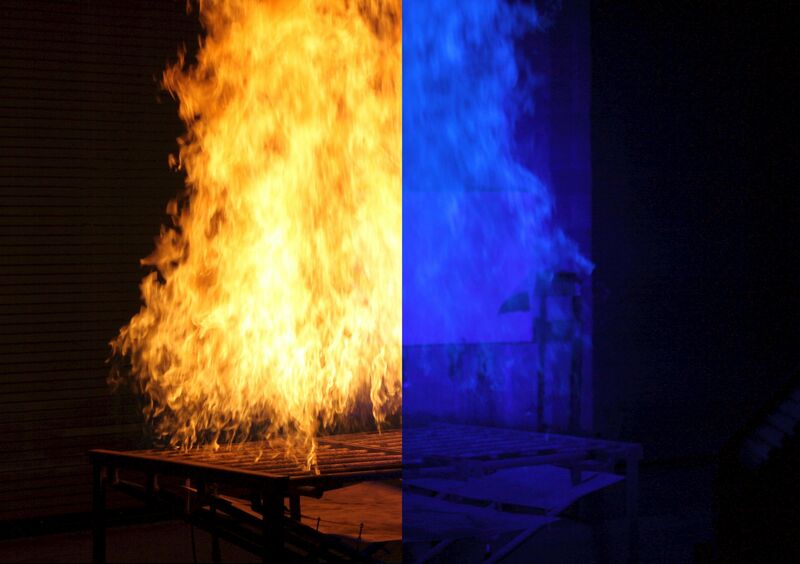 To improve the ability of researchers to "see" through fire, NIST has developed an imaging system using ordinary blue light to dramatically clear the picture. Hoehler also has been involved in the development of a second method for imaging objects through fire with colleagues at NIST’s Boulder, Colorado, laboratories. In an upcoming NIST paper in the journal Optica, the researchers demonstrate a laser detection and ranging (LADAR) system for measuring volume change and movement of 3D objects melting in flames, even though moderate amounts of soot and smoke.